OAKLAND — The first gummy bear was sacrificed last week during an experiment in the newly renovated science lab at Valley Middle School. 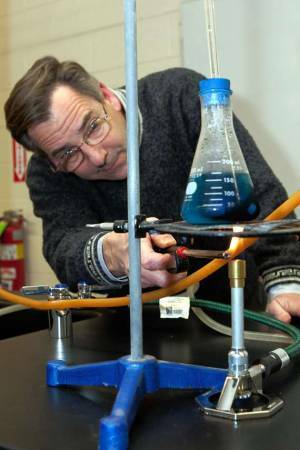 Donald Dean, science curriculum coordinator for the Oakland K-8 district, conducting an experiment marking the renovation of Valley Middle School’s science lab. Donald Dean, the K-8 district’s science curriculum coordinator, demonstrated in front of a crowd of some 50 people what happens when sugar is mixed with molten potassium chlorate. When the gummy bear was dropped into a test tube containing the chemical compound, it ignited, in turn igniting a round of applause. It was the defining moment of an event organized specifically to celebrate the refurbishment of the lab, a classroom that had not been updated since the school was built in 1969. Minutes before the experiment, district officials and representatives of the Oakland Education Foundation cut a ceremonial red ribbon. Renovation of the classroom was funded through a $100,000 grant from the foundation. The ribbon-cutting Monday, Feb. 13, was attended by Mayor Linda Schwager and by a majority of the Borough Council. Administrators, teachers and parents, too, filed into the school’s library, where the event began. “In the fall of 2009, our officers and trustees were full of fresh fund-raising ideas,” said foundation president Margaret Kourgelis, kicking off the proceedings. The school has two labs. The other lab was renovated in 2006, also with funds raised by the foundation. Kourgelis presented an enlarged check to Board of Education president John Scerbo, who thanked the foundation for its support. School board trustee Jennifer Matts, who serves as liaison to the foundation, said district officials wanted to update the second lab to ensure all students have the same educational experience. The renovated lab has a glossy floor and seating for 28 students. Sturdier tabletops, which are burn-proof and stain-proof, are made of epoxy resin. 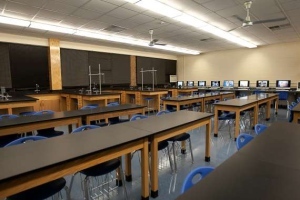 The classroom also features an emergency shower, an eye-wash station, a fume hood, four work stations with sinks and 16 new computers, including eight laptops. The fume hood allows classes to perform more complex experiments, like oxidation of a gummy bear. Hughes said the lab is now used by seven seventh- and eighth-grade classes. Next year, he said, the classroom will likely be occupied all eight periods of the school day. The event was capped when schools Superintendent Dr. Richard Heflich asked the foundation to embrace the district’s next technology initiative: equipping all four district libraries with iPads. He said the district would need $37,500 to buy 50 of them. He said the district received a federal grant last year to buy iPads for four special education classrooms. The foundation’s flagship fund-raiser, a casino night gala, is scheduled for 7 p.m. Saturday, March 17, at Portobello Banquets, 155 Ramapo Valley Road.